This technical note describes the application of two different strategies (simple- and fed-batch) for the culture of CHO-S cells using Cellexus Biosystems’ (www.cellexusbiosystems.com) CellMaker PLUS™ bioreactor with disposable HybridBag™. The first study involved the comparison of cultures grown in shaker flasks with that grown in the CellMaker PLUS using a HybridBag. A control culture was established in a 500 mL flask containing 50 mL CHO-S media (Gibco) at a cell density of 5×105 cells/mL. Concurrently, a culture was established in the CellMaker PLUS by inoculating 2.4 L CHO-S media in the HybridBag, also at 5×105 cells/mL. Both cultures were grown under identical CO2 concentrations (8%), at 37ºC; the shaker flasks were shaken at 80 rpm, whereas the HybridBag was aerated at 100 mL/min with a gas composition of 46% air, 46% N2, and 8% CO2. The HybridBag was stirred using the propellers at 30 rpm. After six days of growth, the volume of both cultures was expanded twofold by the addition of an equal volume of fresh media to the culture. The final volume of the HybridBag culture was therefore 4.8 L. Growth was monitored over a 16-day period, throughout which cell counts and viability were determined using a hemocytometer and trypan-blue staining. Viabilities of greater than 85% were achieved in both shaker flask and HybridBag cultures. The fed-batch strategy was designed to expand a culture within a single HybridBag from 1 to 7 L, thereby reducing the need for a large initial inoculate to be produced in many shaker flasks. The purpose of this study was to demonstrate the flexibility and adaptability of this system for large-scale cell culture using a complex fed-batch protocol. A CHO-S cell inoculation culture was grown up to a final cell density of 1×106 cells/mL in shaker flasks in CHO-S media (Invitrogen) at 37ºC, 8% CO2, with a shaker speed of 80 rpm. The HybridBag culture was established using 1 L of CHO-S media preheated to 37ºC and was inoculated with CHO-S cells to a final concentration of 5×105 cells/mL. The culture was gently stirred using the HybridBag propellers at 30 rpm (30% max speed), which prevented cells from settling and achieved culture aeration. An overlay in the headspace was created with a mixture of 46% air, 46% N2, and 8% CO2, with a flow of 100 mL/min. The integrated WIDGET™ dO2 probe was used to measure dO2 concentration, which was maintained by the CellMaker PLUS Controller at 30% air saturation by adjusting air/N2 ratios. Once the cell density had reached 1×106 cells/mL, the culture was diluted by the addition of 1 L of fresh, preheated CHO-S media to give a new culture volume of 2 L and growth was monitored. D-glucose was determined using a hand-held blood-glucose analyzer, and the culture concentrations were maintained between 1,000 and 1,500 mg/L by the addition of fresh D-glucose from a 100 mM stock solution. In addition, fresh L-glutamine was added to 0.2 mM L-glutamine final concentration every 72 hrs. Once the 2 L cell culture in the HybridBag had reached a cell density of >8×105 cells/mL, culture aeration was switched from the headspace to the sparge tube; this increased the efficiency of aeration, which was necessary for optimal growth of the expanding culture. The combination of the integral propellers and airlift also increased the mixing of the culture and eliminated cell settling, even in the corners of the HybridBag where settling might have been expected. Antifoam (Sigma SE-15, 10% v/v) was routinely added to all cultures and had no impact on cell density or viability at the concentrations used. Antifoam preparation (1 part antifoam plus 2 parts PBS) was added to the HybridBag and shaker flask control to achieve a concentration of 1–5 ppm every 72 hrs. The 2 L of expanded culture in the HybridBag was then diluted with a further 2 L volume of fresh CHO-S media once the cell density saturated at >1.5×106 cells/mL, to give a new culture volume of 4 L. The culture was maintained in the HybridBag, using this volume expansion/feeding strategy, to a final working volume of 7 L, at which point the culture was grown to saturation, achieving a final cell concentration of 3.8×106 cells/mL. Throughout the growth of the culture, cell counts and viability were determined using a hemocytometer and trypan-blue staining. Viabilities were determined to be >95% in the HybridBag culture. In the first protocol, a simple-batch culture procedure was performed. The CellMaker PLUS culture was established in a volume of 2.4 L and inoculated with shaker flask-grown cells to a final concentration of 5×105 cell per mL. The HybridBag culture was then maintained with a fixed volume of 8 L.
Both the HybridBag and shaker flask showed comparable growth curves until higher cell concentrations were achieved, after which the culture in the CellMaker PLUS grew to a concentration of 4.1 x106 cells/mL, whereas the shaker flask only achieved a concentration of 2.2 x106 cells/mL. The viabilities were comparable and were above 95% up until Day 12. While simple-batch culture is easy to achieve using flasks as the seed culture, this becomes limiting when scaling to larger volumes because of the number of flasks required. In the second protocol, the same CHO-S cell culture was expanded from 1 to 7 L within a single HybridBag (Figure 1). Once the required volume was achieved, the culture was grown to saturation at a concentration of 3.8 x106 cells/mL. 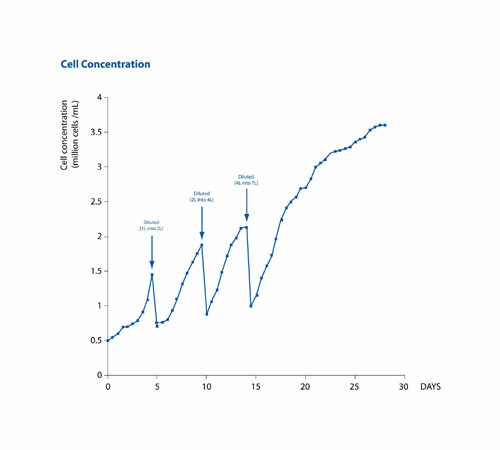 This was comparable to the cell concentration achieved during the simple-batch protocol (Figure 2). In the fed-batch protocol, a viability of greater than 95% was achieved over a period of 30 days. 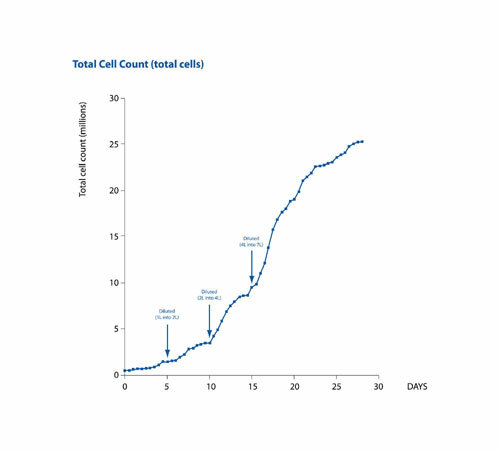 This data demonstrates the efficient fed-batch expansion of a CHO-S cell culture from 1 to 7 L using the CellMaker PLUS bioreactor and HybridBag. In this study, the aeration mixtures and flow rates were controlled to achieve optimum dO2 and dCO2 levels at each stage of the culture process. In both strategies the initial culture had a low requirement for oxygen, therefore stirring the culture while overlaying with an N2/air mixture enabled sufficient supply of O2 without introducing the risk of O2 toxicity, while maintaining CO2 levels for pH control. At higher volumes and cell densities, the increased requirements for O2 and CO2 were met through the use of the more efficient sparge tube delivery of gas. Sparging a gas mixture through a culture achieves greater mass transfer than can be achieved in shaker flasks or rocker systems. The HybridBag therefore uses a fusion of passive transfer (stirring) and active transfer (sparging) using a hybrid-mode of airlift and STR. Cell settling was observed in flasks that were not agitated sufficiently. In the HybridBag this was entirely prevented by gently stirring with the two small integral propellers, without imposing damaging shearing forces often associated with stirred systems. Stirring combined with the airlift effect provided thorough and effective mixing. Foaming was managed through the addition of antifoam as required, with final concentrations of just 1–5 ppm (up to 200 ppm is not unusual in mammalian cell culture performed to production scales.) These studies therefore demonstrate the consistency of the growth curves in the HybridBag irrespective of the batch strategy used, the improved performance compared with a shaker flask, the flexibility of the HybridBag, and the benefit of a fusion of airlift and stirred principles. The CellMaker PLUS (1–8 L) system has the flexibility to culture either small or larger volumes in a small-footprint system that does not require incubators, or a large area of bench space. In addition, the CellMaker PLUS has several features that improve the growth and viability of CHO-S cells compared with shaker flasks including dual-action mixing, truly disposable sensors for dO2 and pH to reduce chances of contamination, precise dO2 control using air and nitrogen to optimize cell growth, and automated blending of CO2 in headspace and sparge tube for simplicity. Ian M. Taylor, Ph.D., is commercial director at Cellexus Biosystems.